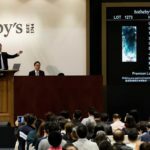 Sotheby’s reported a profit of $91.7 million, or $1.33 a share, versus a year-earlier profit of $85.4 million, or $1.24 a share. Revenue ticked up 0.3% to $304.9 million, as the commission margin improved to 15.9% from 15.3%. Analysts surveyed by Thomson Reuters projected a per-share profit of $1.37 on revenue of $318 million. Expenses increased 2.4% as the company continues to invest in expanding its digital media offerings and presence in emerging markets such as China. Can Sotheby’s Contain the Forces of Change?